The Government is currently running a Growth Vouchers scheme, which provides matched funding (of up to £2,000) to UK businesses. The scheme is designed to help businesses find trusted and accredited strategic advisors to help grow their business, either through investment in attracting and retaining new staff members or through attracting new clients and revenue streams. The Government vouchers will fund up to half of the cost of the advice, making it a very cost effective way for your business to get the help and advice it needs to succeed. You do need to move quickly as the scheme is closing to new applicants on 31 March 2015, meaning you have just 13 days to apply! For more details on the Growth Voucher scheme, and to apply for this funding, please look here. 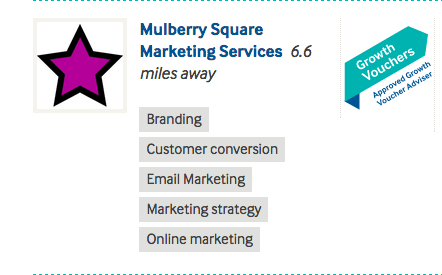 As an accredited advisor for the Growth Voucher scheme, we at Mulberry Square are perfectly placed to work with you to improve your business strategy and offering. We have many years experience in business improvement, primarily in driving customers to you and helping you convert them from prospects into paying clients. We offer advice and practical support in all areas of online marketing, including search engine marketing, website design and development, Google AdWords campaign management, social media marketing, and much more. We’re also experts in successful offline print marketing campaigns and will help you promote yourself offline, either in support of your online presence, or as a stand alone promotion if that is more appropriate for you. If you want to know more about how we can help you then please just get in touch on 0116 237 4603. We’d love to find our more about you and your business, and how we can help you.